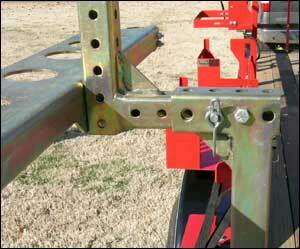 "Base Mount" provides the height needed for use on open trailers or can be shortened for use on pickup trucks. Installing a "Base Mount" to each vehicle assures quick switch over of the "Rack Unit". The adjustable “Quick Coupler” provides the offset needed for mounting on pickup trucks and utility vehicles. Use it in conjunction with a “Base Mount” or by itself as a mounting location. By pulling a single “Quick Release Pin” the “Rack Unit” can be removed in seconds and placed on another vehicle or stored inside overnight with no need to remove the individual tools. 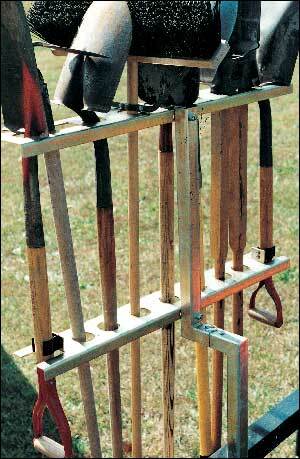 Heavy gauge plated steel construction stands up to weather and years of hard use.